Boundaries: South Congress Ave. from Town Lake to Oltorf St. The South Congress district, more commonly called SoCo to the locals, is a mile and a half strip with some of Austin's hottest nightlife, bars, cafes, restaurants, shops and more. The bars and clubs in SoCo reflect their past that doesn't include much glamor, but contains a nostalgic flare. SoCo in Austin has come a long way from past years and is now one of the most frequented places to hang out in the entire city especially with its incredible view of the Downtown Austin skyline. 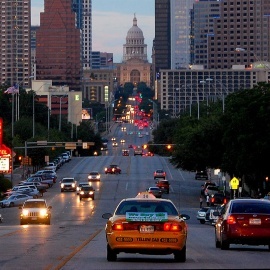 Popular parades like The Texas Independence Day Parade in Austin and events like First Thursdays in Austin, Texas happen on the SoCo strip. First Thursday is one of the most popular events in Austin, which celebrates the first Thursday of every month with what can only be best described as a giant block party. If fun is what you're looking for, there is plenty to be had in the SoCo District of Austin, Texas for both locals and visitors. The more the merrier!